Halloween is a little different in the monastery than it is in the secular world. 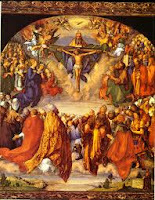 Here we see it as the vigil of one of the great feast days in the Church, the beginning of the celebration of All Saints' Day. In the evening we pray the Office of Readings and add the Litany of the Saints. This ceremony starts our rejoicing with our brothers and sisters of all ages who have completed their mission on this earth and have joined the heavenly choirs in eternity. And the celebration continues throughout the day on November 1. Besides the commemoration of our canonized saints and those who have been declared ‘Blessed’, we look on this as the feast of those hidden ones who have finished their course and quietly slipped into beatitude. They have been faithful or repentant and made their peace with God. Many of them are members of our own families, or the grocer down the street, or the receptionist in the dentist’s office, or the lady at church who always said a prayer for our intention, or the bus driver who had a cheerful word for weary passengers. In the early days of the church all the Christians were called ‘saints’, meaning, not that they were unusual or outstanding in virtue or devotion, but that they were those whom God had endowed with the gift of Faith in His Son, Jesus. As we go through our ordinary days, doing the little things we do for love of God and neighbor, we too, can think of ourselves as part of that beautiful company of those who love God. 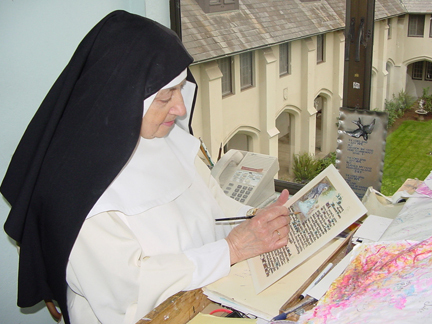 At the time of her death, Sister Mary of the Holy Spirit was in the 94th year of her life and the 66th year of her religious profession. She was well known as singer, artist, and poet, but especially as an intercessor. Her outstanding characteristic was compassion. Sister loved to pray for all who are in pain, either physically, mentally, or spiritually. When anyone was suffering, she would suffer along with them in their time of trial. This extraordinary empathy was the charism given to her by God for His people. In heaven she will continue her ministry of intercession and will obtain strength and comfort for all who ask her prayers. For those who would like to know her better we offer her vocation story. How long did it take me to decide to become a Religious? ONE WEEK! Dancing, singing were the very loves of my earthly life. 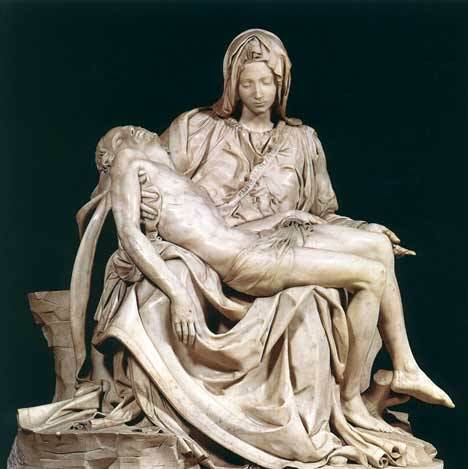 However, there were yet greater loves not of earth - but by faith and His Grace - Jesus and Mary, my constant ‘companions’. I had studied voice for some years and performing was part and parcel of what I loved to do. 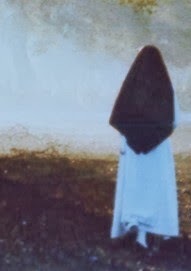 Religious life and a nunnery were the farthest thoughts from my mind. Besides, there was Joe - who had proposed and we were to be engaged when he returned from Germany after his tour of duty in World War II. A confession turned my whole life around. During confession one evening, a priest I did not know posed the question, "Have you ever thought of being a Nun?" "No, Father, I am going to be married." "Then, come to me next week and I’ll give you instructions on the Sacrament of Matrimony." That was THE WEEK that changed my life. On the way home, I said to my sister who was with me, "I wonder what it’s like to be a Nun." On my trip to confession the following week, instead of asking about the Sacrament of Matrimony, I asked what it was like to be a Nun. "How long can you kneel?" asked he. And so, after some words of explanation, none of which I now recall, he asked me to visit the Monastery in the Bronx - Corpus Christi. That visit led to a love affair that overpowered any idea of Joe. I wrote to him and told him that I’d found a Greater Love. And great person that he was, he accepted my explanation. That was a love affair that started over 60 years ago, and has been a joy throughout my life. Never a moment’s doubt. His grace has been there supporting that decision to enter His House and even now, I can hardly believe my good fortune. Oh yes! The singing and dancing have not departed from me. Happily and gratefully, I have sung His praise now for 60 years and more. and for which I can never be grateful enough. Monday, October 17, 1:30 p.m. - 5: 30 p.m.
Tuesday, October 18, 7:00 a.m - 5:30 p.m.
Wednesday, October 19, at 11:00 a.m. In early October we had a wonderful workshop with Sister Kathleen Harmon, S.N.D.deN. who is an expert in both the field of music and that of liturgy. Sister gave us good theological explanations of the changes in the translation of the Mass in the New Roman Missal which will go into effect on the first Sunday of Advent. At the same time, Sister Kathleen was able to coach our chantresses, organists, choir, and lectors, to improve our voice production and delivery, which is so important in our mission of preaching through the liturgy. The improvements in our choices and the quality of our reading and singing are already evident. We recently had the privilege of hosting the Vigil service for the funeral of our dear former chaplain, Fr. Sam Parsons, OP. 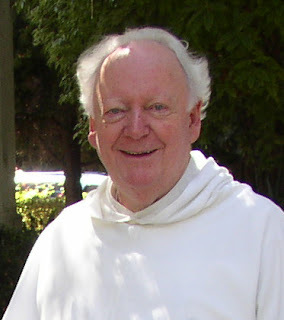 Great Scripture scholar that he was, Father taught for many years at the Angelicum in Rome during the school year and in various schools in this area during the summer. During the years that Father Sam was with us when he was semi-retired, he treated us to weekly lectures on Scripture which opened our minds to the beauties of the holy writings, especially the Letters of St. Paul. As he aged and had to retire from all active ministry, he kept in touch and demonstrated as great a love for our community as ours for him.